MANiMaL was named as an acronym of the first initials of our foreign exchange students. MANiMal had great collection abilities for the game basketballs and a shooter that was accurate and consistent. The bridge lowering system was simple and effective. Strong drive, rapid basketball collection, staged shooter loading system, a tracking system that improved throughout the season. 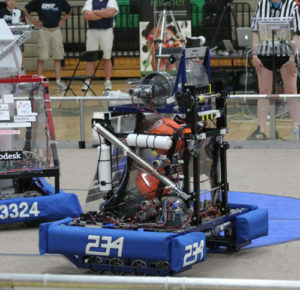 Sensors automatically managed the basketballs in the lift system and advanced them for shooting. At one point at the championship event, we were ranked last place- 100 of 100. we continued to work and improve and became the 11th pick in the draft and advanced to the Semi-finals.